Popeye would have loved this Salad! As the name implies, the salad is SUPER and full of SPINACH. 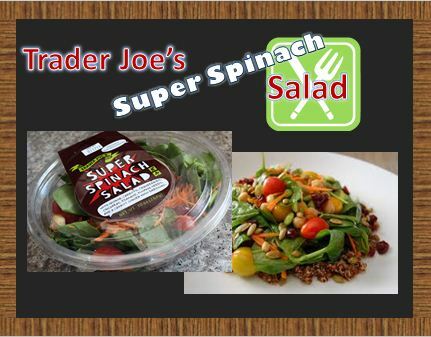 The spinach is decorated with a ton of super healthy, super tasty ingredients like shredded carrots, dried cranberries, quinoa, edamame beans, grape tomatoes, chickpeas and pumpkin seeds. It is conveniently packaged with a super carrot-miso-ginger dressing. We highly recommend dumping the dressing into the salad container, closing lid, and shake-shake-shaking the container till the salad is completely dressed up to your taste buds delight. 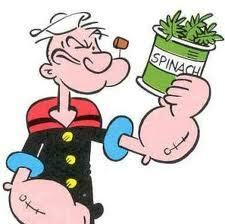 With 9 grams of protein and a price tag of $3.99, you will be super happy with your Super Spinach Salad. It's really good stuff! I've taken to making it at home, I have a recipe for it on my blog.